There are many different activities that can be enjoyed through the months of fall. It’s a special time of year for many people, with some of the most popular holidays celebrated in fall like Halloween and Thanksgiving. It’s also a time for harvest, with many popular fruits and veggies coming into season and appearing in our kitchens and grocery stores for use in all kinds of tasty fall recipes. One perfect example is apples. There are many different varieties of apples, with each one ripening at different times of year, but apple picking season generally runs from the end of summer through to the beginning of winter. This means that fall is the prime time to head outdoors and do some apple picking with your friends and family. 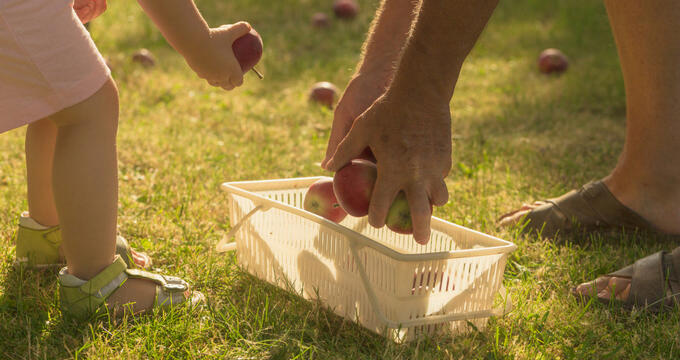 This can be a lovely activity to enjoy on a crisp fall day and it’s a great way to spend time with youngsters too, so apple picking is a highly popular thing for families to do with their free time. Picking apples is a big part of American culture, going back many years, especially in the eastern states like the New England and Mid-Atlantic regions. Maryland is a great example, with the state being home to a long list of family-friendly farms and orchards. The great state of Maryland has just the right conditions to grow all kinds of apple varieties, from timeless classics like Empire, Fuji, and Gala, to more unique, lesser-known varieties. There are a lot of excellent apple picking locations to be found all around Maryland, so if you’re looking for a good farm or orchard to spend a few hours in, be sure to read on and learn all about Maryland’s favorite apple picking locations. Located in Parkville, this lovely little Maryland fruit farm offers pick-your-own sessions all through apple picking season, but times and dates can vary depending on the weather and the harvest, so it's essential to call up ahead of time or check out the farm's official site to learn more. Strawberries, peaches, blueberries, and blackberries can also be picked at this farm, but there's a big focus on apples, with a lot of different varieties to choose from. Weber's also makes some of the very best apple cider in all of Maryland, so be sure to stock up with a few bottles if you're in the area. A farm market is also situated on site, with freshly baked goods, ice creams, jams, jellies, turkeys, and much more available for purchase. There's also a little barnyard filled with animals for the kids to enjoy, as well as straw mazes, play areas for the kids, hillside slides, hayrides, and more, making this a super spot to spend a full day of family fun. Located in the northern central part of the state in Carroll County, Baugher's Orchards & Farm has been serving the great state of Maryland for over a century now. This is a fully-featured apple picking location, complete with a country-style family restaurant, two separate fresh produce markets, a bakery with all kinds of delicious treats straight from the oven, and much more. Strawberries, cherries, peaches, pumpkins, and nectarines can be picked at Baugher's Orchards and Farm, in addition to a wide variety of apples. Tractor rides transport guests over to the pick-your-own areas, with the following varieties up for grabs: Fuji, Empire, Stayman Winesap, Jonagold, Red Delicious, Granny Smith, Ida Red, Gala, and Golden Delicious. As well as apple picking, visitors at Baugher's can also take home some top quality apple cider and many other apple-based products, along with local honey and more. Not too far outside Washington DC, Waters Orchard is another super apple picking location in Maryland. This family-friendly orchard has been ranked as one of the best to visit in the entire DC metropolitan area due to the astonishing beauty of its surroundings and the quiet, peaceful atmosphere you can enjoy as you roam among the apple trees. Open from 9am to 5pm on various days throughout the apple picking season, Waters Orchard offers U-Pick services on a variety of different apples including Pink Lady, Fiji, Granny Smith, and others. Freshly-made apple ciders are also available for purchase, and the site plays host to an annual Pumpkin Festival too, which is always a big hit with families and the local community.